Robert A. 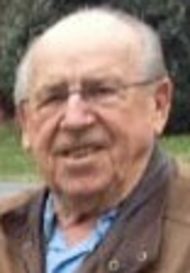 “Bob” Wolfe, Sr., 95, of Stevens, Pa, passed away on, Monday, March 18, 2019 at WellSpan Ephrata Community Hospital. Born in Womelsdorf, Pa, he was the son of the late Charles and Anna (Bennethum) Wolfe. He was married to the late Dorothy Wolfe who passed away in 1999. He is survived by his son, Robert A. “Bob” Wolfe, Jr., husband of Marcia of Palmyra; his daughter, Carol Hammond, wife of Fred of Manheim; grandchildren: Natalie, Jennifer, Melissa, Todd and Matthew and great grandchildren: Erin, Danny and Antonia. He was the companion of Jean Gibbel of Bethel for 18 years. He was the last of his immediate family. He served at the United States Army Air Force training base in McCook, Nebraska during World War II as a Military Policeman. He worked for 45 years at the Bedford Shoe Co., Lititz. After retirement he and his wife moved to a small farm to raise thoroughbred race horses. He was an avid Phillies and Eagles fan, who from the comfort of his living room had been explicitly managing and coaching those teams for over 70 years. There will be a viewing on Friday, March 22, 2019 from 11 AM until 1 PM at the Charles F. Snyder, Jr. Funeral Home & Crematory, 3110 Lititz Pike, Lititz, PA 17543. Burial will be private. In lieu of flowers, memorial contributions may be made to the National Stroke Association by visiting: www.stroke.org. Sorry to here of uncle Robert’s passing, Our thought’s and prayers are with you.Julia a Wolfe Bronson.